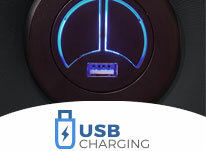 USB port is available for this power recline switch. High in density and supportive, yet still soft and very comfortable. The Elite C1-M offers some of the highest-quality luxury home theatre seating on the market, featuring superior design and construction for the discerning home theater taste. The C1-M is crafted from a solid commercial grade wood frame and then filled with a high-grade seating foam of medium firmness, for outstanding lumbar support. The two-section seat back is topped by a padded headrest, while elegantly curved armrests provide cup holders to keep drinks safe and within arm's reach. The C1-M also features a power recline, from which you can adjust to any desired position at the press of a button. This home theatre seating is topped with a leather material that offers supple texturing, a smooth caressing feel, and easy maintenance which only increases in patina over time. In addition, the the C1-M comes with a wall-hugger design which allows it to be placed as close as four inches from any wall, even in full recline--perfect for those wishing to maximize space in their theater. 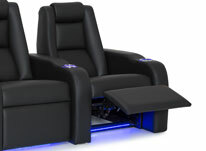 This home theater seat is an instant classic of its kind that will provide lasting enjoyment. Many of our theater chairs are in some of the finest public VIP cinemas in the world including the Venetian Hotel in Macau. So our theater seating must be built and engineered to withstand the use of countless daily visitors to these commercial theaters. With expertise in design, layout, manufacturing, and production - you can be confident that the Elite HTS team is ready and able to help you get the most out of your custom theater seating. Whether you're looking to complete the design of your home theater room, or you want to update the seating in your corporate screening room - we will work with you to ensure you get the seating that works specifically for your needs. Elite HTS was founded 10 years ago by our President and CEO Bobby Bala. With a background in CG Animation and Video Game design, Bobby was focused on designing and delivering the sleekest and highest quality theater seating possible. Our first ever order was actually built out of an old abandoned barn. Now, more than 10 years later, Elite has grown from those humble beginnings to a new, state-of-the-art facility all while providing theater seating to our many satisfied worldwide clients. CineSuede is a sterling high quality fabric for those looking for a multi-purpose material that provides a Warm and Cozy theater environment. Fabric is renowned for projecting an informal, laid-back feel that is both warm and inviting; more than any other material, it reminds one of the comforts of home. Specifications and Methods to care for your seat material: Read More. Our Top Quality line of buttery soft, Italian Leather. Elite HTS uses only the finest Italian Leather that is not only durable, but soft and luxurious as well. Our leathers are dyed and treated using th highest standards to maintain color pigmentation and eliminate color fading. Addictive to the Touch Silk Leather is a revolutionary new material that is luxuriously soft as silk, yes has the look and durability of traditional leather. Looking closely, you can see that the material is porous which allows it to "breath", so the occupant stays cool and comfortable. 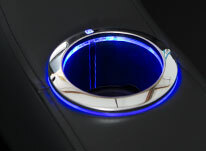 At the same time, it is warm to the touch, so if provides a warm and cozy feeling even in cooler environments. Lastly, the material does not hold air in the cushion like traditional leather, this creates a very nice bouncy, "marshmallow effect" on the cushion. In collaborations with renowned Chiropractor Dr.Gran O'Neill to create a theater chair that provides optimal ergonomic support and comfort while still staying soft and "cushy". After a lot of precise tweaking and adjustments of various foam types, placement and angles, the final creation is what we feel is the most comfortable theater chairs ever made. A true chair provides ESCAPISM. Weighing over 60lbs, our industrial strength " whisper quiet" recline mechanism. We use only the best cushioning foam that is manufactured with a maximum resilience technology for hours of comfort and support. 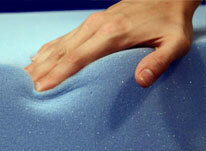 The foam is high in density and supportive, yest still soft and very comfortable at the same time. REVIEW: I loved what these chairs looked like on the web site. However, I have to say I was very hesitant to buy such a high priced chair without actually sitting in it. Especially, since I was going to buy ten. I took the plunge. I can say I couldn't be more pleased. I am very picky and insist on a high quality product. 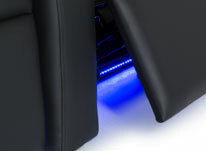 The C1M is the baseline Elite seating and I can't believe the quality of this product. The look. The feel and smell of the leather. Extremely comfortable. I just can't say enough. So if you are thinking of getting these chairs and are hesitant. Don't be. I can only imagine what their more expensive seats must be like.